To remember that day from years ago. And the scaffold you built was terrifying. A life or death sentence in every word. You tried to rush fate along. That soon you’d have to go out and join the great struggle. You started a wild fight with the city. It could ring out like a battle cry. In 1913, at the age of 19, Vladimir Mayakovsky hit the Russian art scene like a tornado. Within a year, he published his first poems and lithographs; went on a 17-city lecture tour; published articles on Russian theater; wrote, produced and starred in his first play; and, along with his gang of friends, launched a new art movement—Futurism. Tremendously energetic and productive, he turned from one art form to another seamlessly for 20 years. He drew pictures. He exhibited paintings. He wrote, directed and acted in his own plays. He was a film star.1 He created hundreds of agitprop posters. He wrote advertisements for cigars, cooking oil, pacifiers and sausages. He edited the avant-garde art journal LEF. He gave countless readings in clubs, theaters and, after the 1917 revolution, in factories, workers’ clubs and Komsomol meetings. 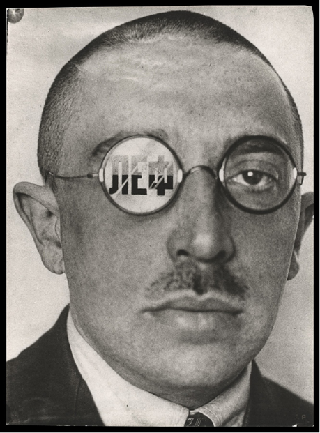 In the course of his career he collaborated with Eisenstein, Shostakovich, Meyerhold and Rodchenko. 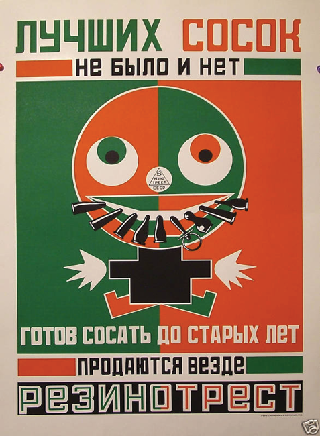 Pacifiers ad by Rodchenko and Mayakovsky, 1924. And he wrote poetry—love poetry, death poetry, odes to the revolution; poems dedicated to the army, to Lenin, to the Brooklyn Bridge, to the Communist Party, to skyscrapers, to the Atlantic Ocean, to the tax collector, and to his own “Beloved Self.” He invites the sun over for tea, he takes Napoleon for a walk on a leash. He’s a horse collapsing from exhaustion, a weepy and frightened violin, a lovesick bear floating down the river on a block of ice. He grows claws, fangs, and a tail. Elephants, giraffes, gorillas, ostriches, baby whales, camels, prostitutes, pimps, criminals and Eskimos all make appearances. He heaps insults upon the petite bourgeoisie, upon his fellow poets, and upon God Almighty (“why don’t you just run along back to heaven where you belong?”). 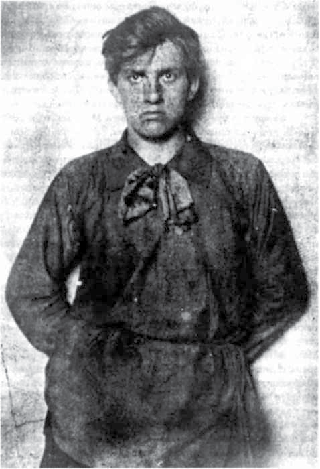 An agitator for the Bolsheviks since late adolescence, Mayakovsky was arrested at sixteen for sedition in 1909 and sent to tsarist prison for the third time. Reckless, big and loud, and always willing to create a scene, before long he was placed in solitary confinement. Five months of isolation put M in an introspective frame of mind, and in reviewing his life, he realized that an art education would make him a more effective tool of the revolution. Alone in cell #103 at Butyrki prison, he immersed himself in literature and painting,2 and made his first attempts at writing poetry. Upon his release, he gave up his activities in the political underground, let his membership in the Party lapse, and became an artist. In 1911, after a year of working in commercial art studios, M passed the demanding entrance exam at the Moscow Institute for the Study of Painting, Sculpture and Architecture and became an art student. The Institute, against the best intentions of the administration, became an incubator for the avant-garde,3 and M quickly fell in with the ringleaders. He found a soulmate in David Burliuk, an older student who had already produced a dozen modern art exhibits, all of them provocative, some of them scandalous.4 Magnetic, cultured and possessing “the professional assuredness of a snake charmer,”5 Burliuk had pulled some serious artists into his orbit—among them, the painters Kazimir Malevich, Mikhail Larionov, and Natalia Goncharova; and the poets Vasily Kamensky, Velimir Khlebnikov and Aleksey Kruchenykj—and now he added Mayakovsky to the collection. Burliuk’s coterie of artists saw themselves as agents of revolution. Sick of the realism of the previous century, sick of the mysticism of the Symbolists, sick of “byt,”6 Burliuk and company were determined to drag art by force into the machine age. Accordingly, they called themselves “The Futurists.” In 1912, they issued their manifesto, A Slap in the Face of Public Taste, and advised their readers to “throw Pushkin, Dostoevsky, Tolstoy, etc., etc., overboard from the ship of modernity,” and to “wash their hands of the filthy slime of the books written by those innumerable Leonid Andreyevs.”7 They said it was their right to “look down at their nothingness from the height of skyscrapers,” to “infinitely despise all the language of the past,” and to bend words, grammar, and poetic structure to suit their will. 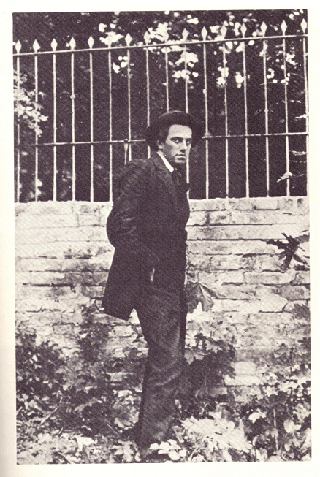 Though the poems included in the publication by M are immature and lack puissance compared to his later work (he was still only 19 years old), they are a testament to the Futurist philosophy: the poems are surreal, seemingly disjointed and nonsensical, peppered with street language, the words split into pieces and staggered across the page. There is the promise of lexical and semantic breakthroughs to come. A Slap was the opening volley. A flurry of Futurist pamphlets, anthologies and booklets followed. 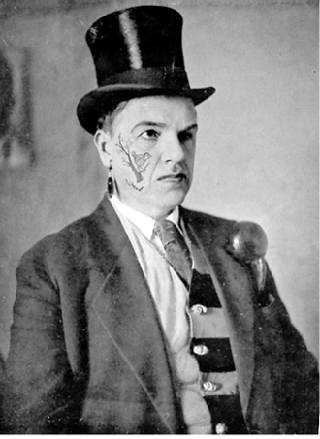 In 1913, the Futurists took their show on the road. The first public Futurist event took place in October of 1913 at Moscow’s “Hall of the Society of Art Lovers.” To promote it, Burliuk had announcements printed on toilet paper. He organized a publicity stunt: a Futurist promenade along Kuznetsky Bridge, one of Moscow’s main streets, the poets marching with dogs and airplanes painted on their faces, dressed in top hats, garish ties, and frockcoats trimmed with rags, reciting their poetry to the crowd. 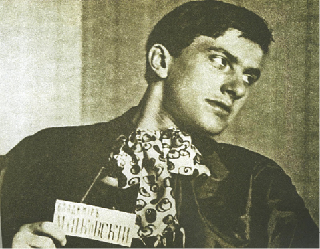 Mayakovsky, wearing a bright yellow shirt with a wooden spoon as a boutonnière, was a natural performer. Standing a head taller than most everyone around him, with a stentorian voice and the demeanor of a Sicilian Mafioso, M at turns cajoled, insulted and clowned. Some were amused and curious, others confused and outraged. Fights nearly broke out, police were called in: all in all, a tremendous public relations coup. While on their subsequent three-month lecture tour, M and his fellow poets would sometimes begin by sitting with each other on stage, drinking tea and casually conversing, as if the audience wasn’t there. Sometimes tea would spill into the orchestra pit, sometimes onto the audience. Sometimes they would perform with a grand piano suspended over their heads. They were heckled, booed and pelted with rotten fruit and bottles. M, whom Pasternak described as “a good-looking youth of gloomy aspect with the bass voice of a deacon and the fist of a pugilist; inexhaustible, deadly, witty,” overpowered every heckler. He once made the claim “I could, without even dirtying my shirtfront, nail them with my tongue to the cross of their suspenders . . . [and] roast this whole collection of insects on the sharp turnspit of my tongue.” Loud debates continued with the audience in the lobby and in the streets after shows. Theaters were surrounded by mounted police, and performances were often broken off in mid-sentence. A few days after the Futurist debut at Art Lovers, M and some of his gang did a poetry reading at the Pink Lantern cabaret. He unveiled his poem, “Take that!” which begins: “In an hour, one by one, your flabby fat will ooze out into the alley.” And then, “Hey you there—you have some cabbage on your moustache, left over from your half-eaten soup,” and “You there—you’re so caked in makeup that you look like an oyster in a shell.” Again, fighting broke out and the police came to shut down the club. 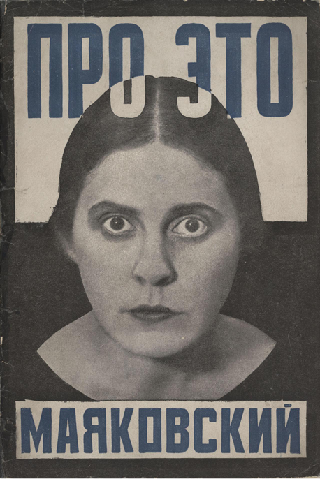 Lili Brik, photograph by Rodchenko. 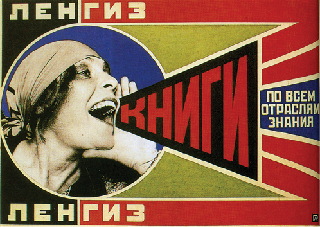 Lili Brik, advertisement (“Books in all subjects!”)designed by Rodchenko. M ended the whirlwind year of 1913 by writing, producing and starring in his first dramatic work, Vladimir Mayakovsky: A Tragedy. Staged in St. Petersburg at the Luna Park Theater, M played the role of The Poet. All of the other characters (A Man without a Head, A Man with One Ear, A Man with One Eye and One Leg, The Man with Two Kisses, The Old Man with Old Dried-Out Black Cats, An Enormous Woman, A Woman with a Tear, A Woman with a Great Big Tear, etc.) appear as cardboard puppets, and each takes their turn either to admire or criticize the Poet. In the second act, The Poet takes center stage, adorned in a toga, crowned with a laurel wreath. He listens to each character’s tale of woe, collects their tears of stone, and, Christ-like, ascends to heaven. M was, in his own words, “booed to shreds,” and had to dodge the rotten fruit hurled at him. The play sold out every night. The play is typical of of M’s 1913 ouevre: brazen, absurd, egotistical to the extreme, adolescent in its intent to shock and antagonize. But it works—because of the startling images, because of his technical skill, because of the novel manner in which he expresses the harshness of city, street and machine, and because of the immediacy and vitality of his language. M captivates with his readiness, at any point, to throw himself headlong over a cliff. He holds nothing back—everything is exposed and open to ridicule. Underneath this lies an impressive core of courage, self-conviction and inner strength—a wholehearted, almost unthinking determination to stand his ground against any onslaught. The first poem is read by Mayakovsky himself, the latter two by his longtime lover Lili Brik, who inspired his greatest love poems (“Backbone Flute,” “About That,” Lilichka! Instead of a Letter,” etc.). 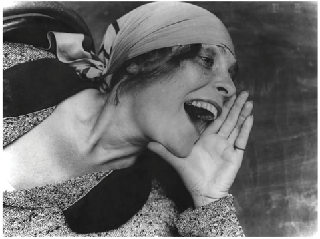 She also served as a muse for Rodchenko, who used her as a model for book covers and advertisements. Along with her husband, Osip Brik, Lili was a major aid in managing, editing, and publishing M’s work. In my translations, I have made no attempt to match the Russian rhyme or meter. Instead I tried to bring out the tone and meaning while staying as literal as possible. The background information above should help put the poems into context. From the Futurist collection, The Missal of the Three, published in 1913. 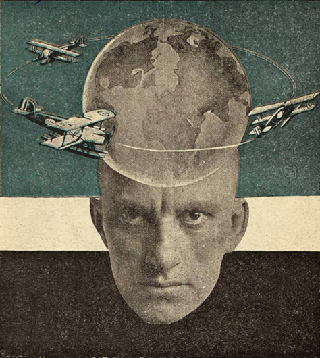 Illustrated by Vladimir Tatlin. Translated by Jenny Wade. Written in 1913, published in 1914 in Number 1 – 2 of the First Journal of the Russian Futurists. Translated by Jenny Wade. 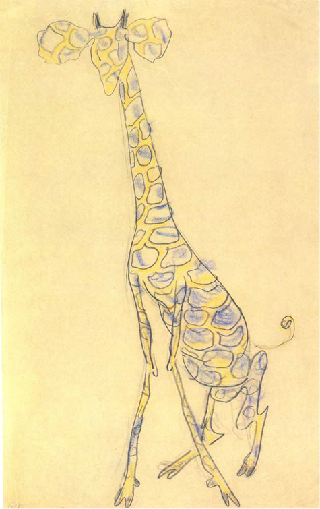 V. Mayakovsky, “A giraffe,” 1913. Pastel and pencil on paper. from the windows of running houses. curve themselves in nooses of cables! to show off motley rusty forelocks. out of the streetcar’s mouth. The bodice of the soul is undone. Published in A Trap For Judges, Number 2, 1913. Translated by Jenny Wade. 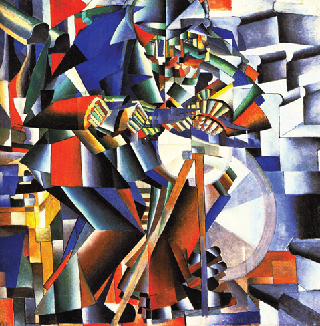 The painter V. Malevich described this poem, with its vivid shifting images, as “versified cubism.” Many of the phrases can be read backwards or forwards. M said the poem was inspired by a streetcar ride along the Sadovo-Sukharvskaya. The clocktower would be Sukharev tower, which was torn down in the 1930s. 1 In 1918, Mayakovsky wrote and starred in three silent films made at Neptun studio in St. Petersburg. The only surviving one is The Lady and the Hooligan. 2 Courtesy of his elder sister, Ludmila, who was able to bring him books and art supplies. 3 Alumni included: Kazimir Malevich, Natalia Goncharova, Vladimir Tatlin, Victor Palmov, Bakulina Lyudmila, Alexander Shevchenko, Konstantin Melnikov, Yelizaveta Zvantseva and Ilya Mashkov. 4 Among the groups Burliuk did shows with: Union of Youth, Jack of Diamonds, Hylaea and Blaue Reiter in Munich. Fellow exhibitors included Chagall, Klee, Picasso and Kandinsky. At one Jack of Diamonds exhibition, painters “decorated their own naked bodies and walked as works of art through Moscow’s streets.” Page 212, Natasha’s Dance, Orlando Figes. 5 Benedikt Livshits, The one and ½ eyed Archer, page 11. 7 A popular, talented and prolific writer of the Silver Age. 9 Memories and Portraits, John Lehmann, London 1951, Ivan Bunin. 10 Livshits, Polutoraglazyi strelets, page 124. “the ship of our love is shattered on the rocky shores of the daily grind.” Actually, this simply says, “the love boat is smashed on byt [however you like to translate byt]”. It just regularly gets translated in a more flowery way than is true or necessary! Fascinating person, the highlights of his bizarre life beautifully organized in this portrayal. Nice work, Jenny Wade! Fabulous, what a find, thank you for this overview of the life of a great poet. Always loved the man, seeking out all I could find on him, so this resource will something I will visit often. What a brilliant article. The poems, recited and printed in both Russian and English, accompanying images and thoughtful commentary made my day. Thank you Jenny. Very impressive. Found a really good JSTOR article about M’s fellow Futurist hooligan Natalia Goncharova. Lots of hard to find details and pictures: http://www.jstor.org/stable/777179. Hello Jenny, I’m doing research about Mayakovsky and English translations of his works. I’ll be happy to hear from you asap and to write about you. Please, contact me via e-mail and tell more about yourself. Thank you again for your excellent work and for sharing it here. Hi Jenny, thanks a lot for your great work and for your love of Russian literature!